Member for Northern Tablelands Adam Marshall at Armidale Livestock Exchange’s Truck Wash, which is soon to double its capacity. THE Armidale district’s freight community will be pumped up by vastly improved truck wash facilities at the region’s saleyards, with $28,564 in imminent upgrades to improve pressure and efficiency, funded by the NSW Government. Member for Northern Tablelands Adam Marshall announced the funding today, provided through the Fixing Country Truck Washes program and said it would greatly improve conditions at the Armidale truck wash.
“Unwashed trucks can be smelly and messy – and pose serious risks to the region’s biosecurity,”Mr Marshall said. “By washing out, truck drivers can ensure towns and roads across the region are kept clean and minimise the spread of noxious weeds and disease in livestock effluent,” Mr Marshall said. 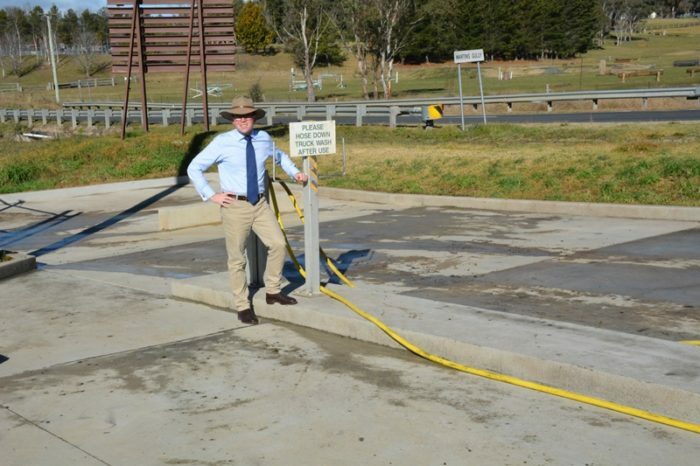 “Armidale Regional Council recently upgraded the saleyard’s truck wash to allow two trucks to park at the same time. Unfortunately, issues with an ageing pump and a limited water supply meant that, in practice, the facility could still only support one truck at a time. “This funding will not only allow two trucks to wash down at the same time, it will also greatly improve water pressure allowing for a better, quicker clean. “Two new pumps will be installed to replace the old model and improve water pressure and the truck wash will get a dedicated water supply to ensure drivers always have a reliable source of water. Brian Kelly, owner of Armidale based freight company Kelly’s Transport, said that the trucking community would be excited by the long-awaited upgrades. “It’ll be terrific when it gets sorted – because currently you’ve got to wait for the other bloke to finish washing his vehicle, which can take ages,” Mr Kelly said. A spokesperson for Armidale Regional Council said construction should begin in the coming weeks.